When it comes to decorating our home, most of the time we instantly think of decorating our living room or bedroom, and somehow the bathroom always ends as last. Truth is, as any other room, it doesn’t need too many items or expensive decor to look great! Below you will find ten ways that you can decorate your bathroom. Some require just a little amount of money and of your time, such as reusing mason jars as your storage place, while others such as having fancy mirror or cool floor tiles may require more money. It’s up to you to find out which of these options is the best for you! 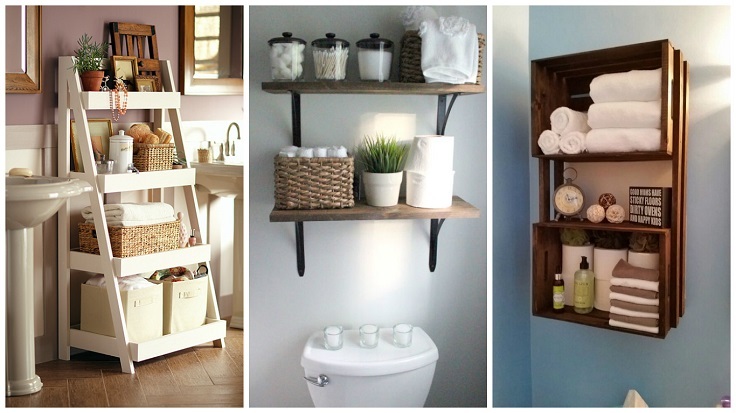 Instead of throwing away old objects, how about reusing them as your bathroom’s art piece? Take this door for example – it’s old and it’s color is faded a bit, but there are few ways that you can use if for decor. 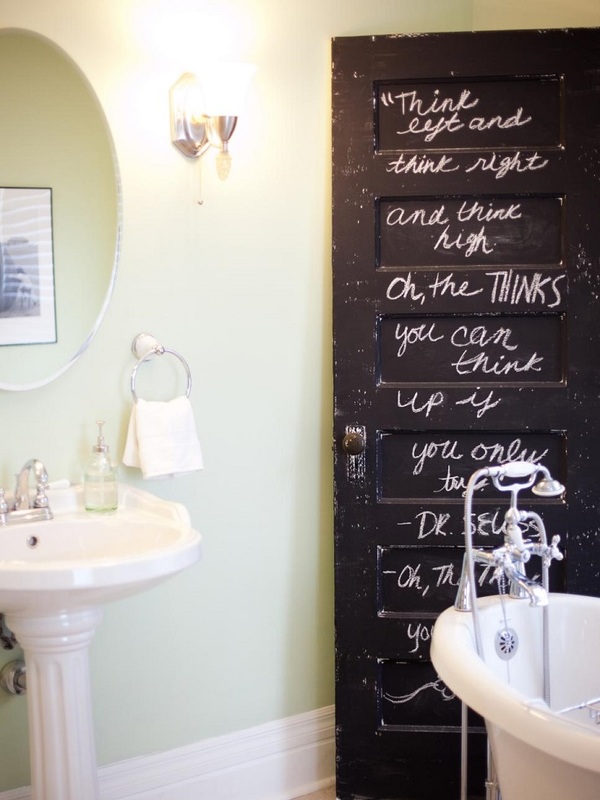 One of those ways is to use chalkboard paint and write or draw something that you’d like. This picture shows how a quote can make it look so art-y! Who says that art only belongs in the living room or the bedroom? For a real art fan, there’s place for it in any other room, including bathrooms! 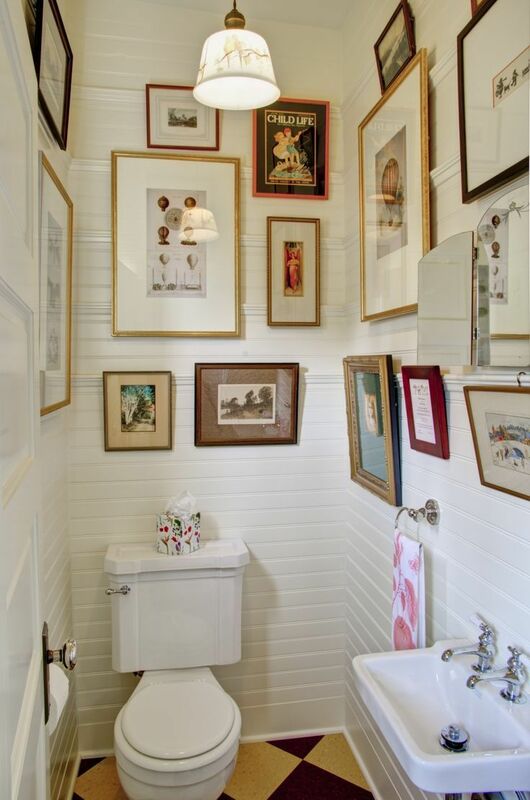 We’d totally understand if this is too many painting in one place for you, but you can just pick few paintings that you like and place them in the bathroom. You can even paint something yourself and we don’t mean anything too art-y, check out some online tutorials for simple wall art. 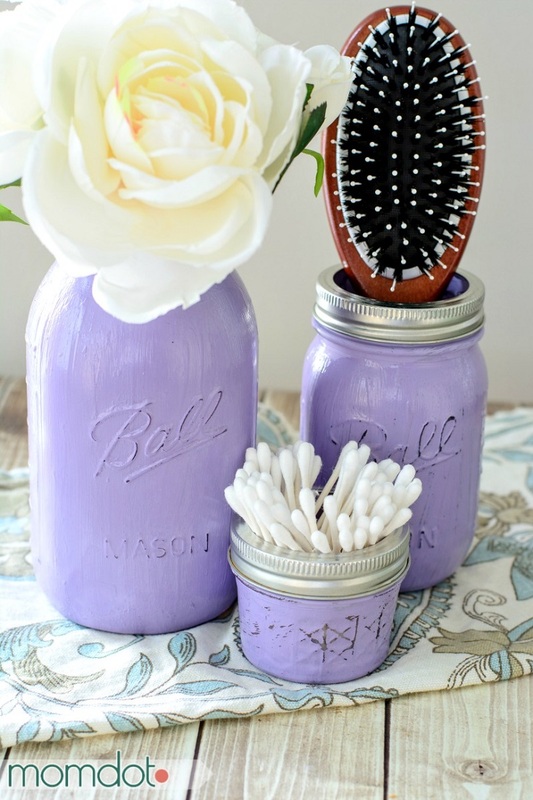 Reusing old mason jars is a well-known DIY project. There are hundreds of ways you can use them for decor, for so many events as well. The best part about them is that they’re cheap and most of the time we already have few at home, so we just need to buy other stuff like craft paint and brushes. However, there are already painted, store-bought mason jars, so if you’re not a crafty person you can just buy them for cheap price. No matter how much money you’ve spent on decor, it won’t leave any impression if your bathroom is a mess. It’s really important to know how to keep things organized and therefore use that in your advantage. There are many creative organization hacks that you can find online, but our favorite is the first one on the picture – wood ladder that can help you with storage and organizing. 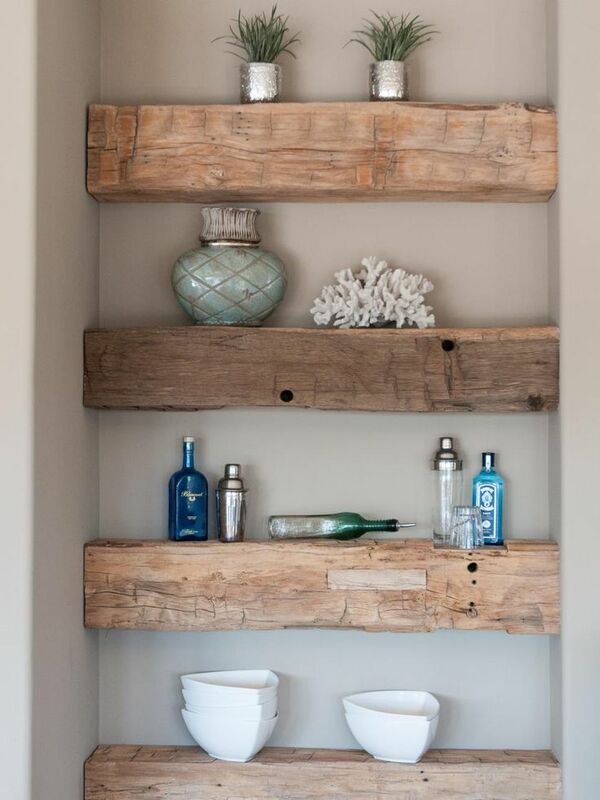 The best way to add rustic vibes to any room, not just the bathroom, is by using wood. Floor, shelves, wooden items, it really is up to you. For example, you can use wood shelves and add few items on them. This will work great if you have small bathroom and you don’t have enough space to add something on the ground. Some go for vintage, others for nautical theme to decorate their bathroom. Here’s an example of how you can add nautical decor – blue-colored items, starfish, anchor chains. 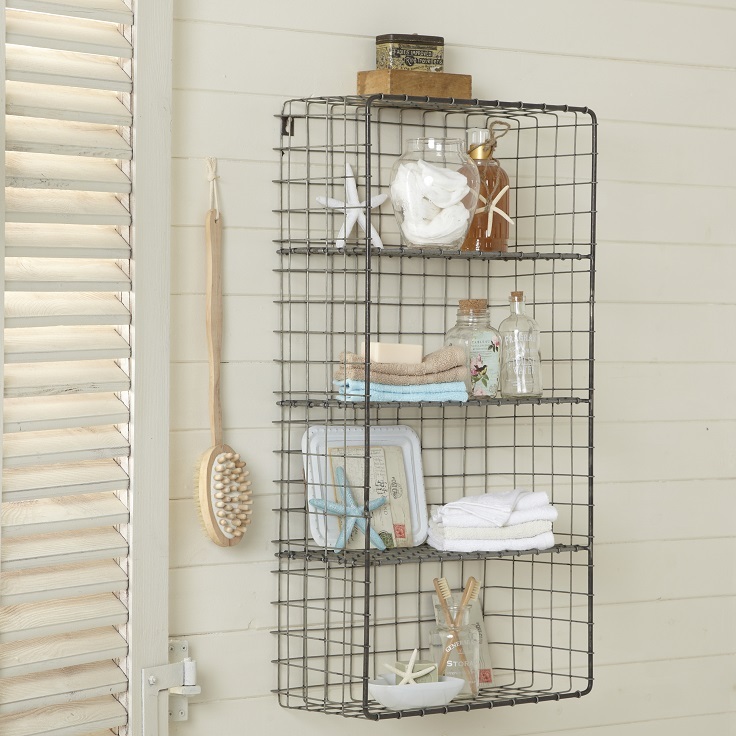 These will all make you feel as if your bathroom as if you’re somewhere on vacation! There are many tutorials online that you can see to make your own decor, or just use store-bought items. When it comes to the Scandinavian design, the most important thing is to keep things simple and functional in a way that they will be so elegant and chic. 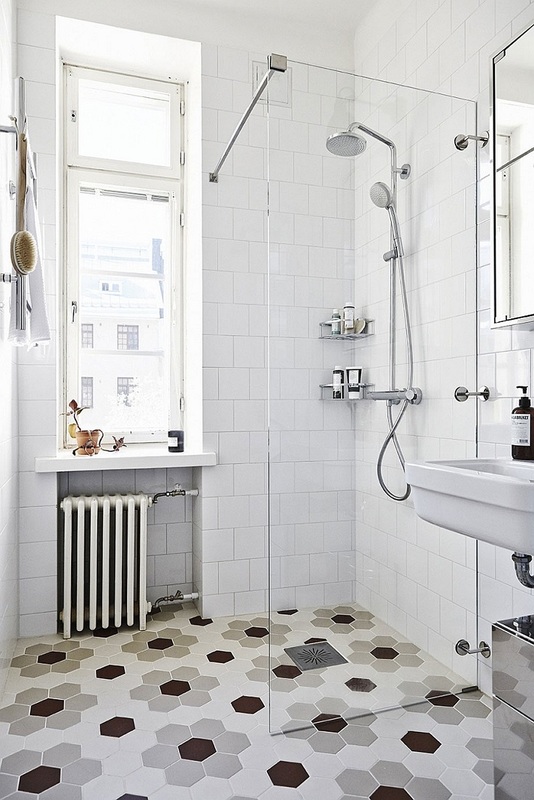 Take this bathroom for example – there isn’t any decor, but the floor tiles are so exceptional and beautiful that they’re the decor themselves. They’re small hexagonal tiles in three colors and they represent such a beautiful example of how geometry can be the perfect decor. Never underestimate the power of the flowers. 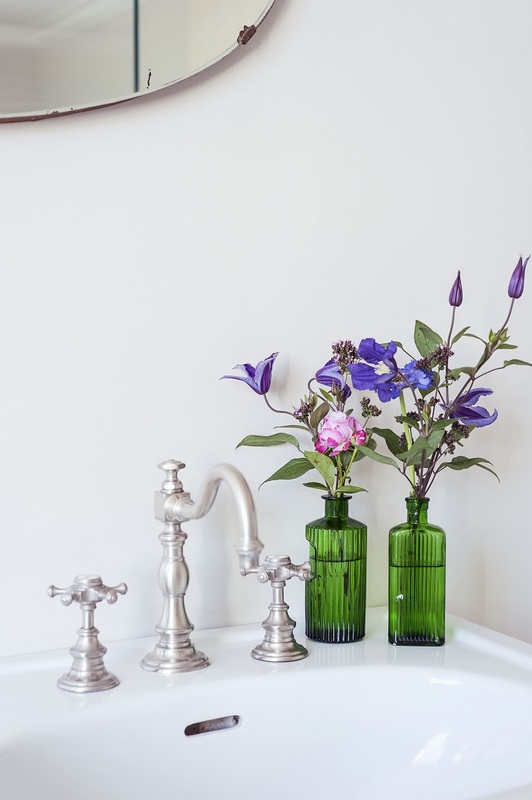 They may seem simple, but they radiate such beauty and charm – especially if they’re placed in bottles instead of usual vases. When it comes to picking the flowers, there’s isn’t any rules, but what is suitable according to your taste. You can pick roses or succulents, or even both. Place them on the sink or next to the window, wherever you like them. Sometimes the only decor that we need is the right color. 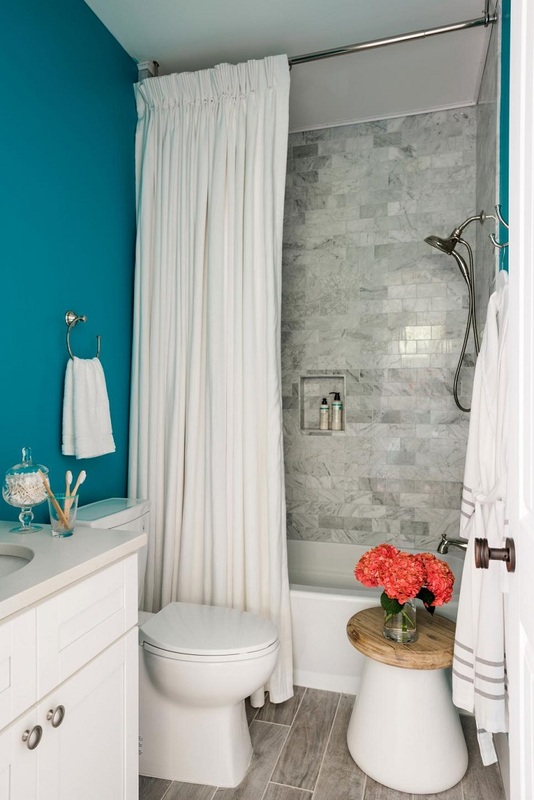 Blue is a usual color when it comes to painting bathroom walls, but also most of the time it’s the baby blue we’re seeing. To make a change, go for a bolder color, such as turquoise. 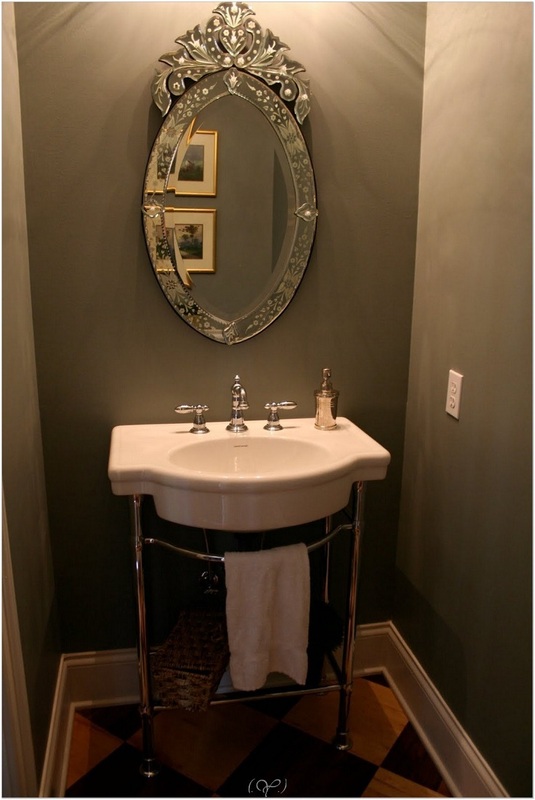 Make sure the other elements are in a more neutral, lighter color such as white or silver. They will be a perfect match with the blue! If you don’t like wall art, mason jars for storage, fancy tiles or anything like that as your bathroom decoration, then maybe you’re going to like this – the main detail in the bathroom will only be the mirror. On this picture we have a very glamorous one. We’re sure that a mirror like this will make everyone to come up and see it! Keep it clean and keep it centered.